Riddle me this, riddle me that, you'll adventure on the wings of bat! 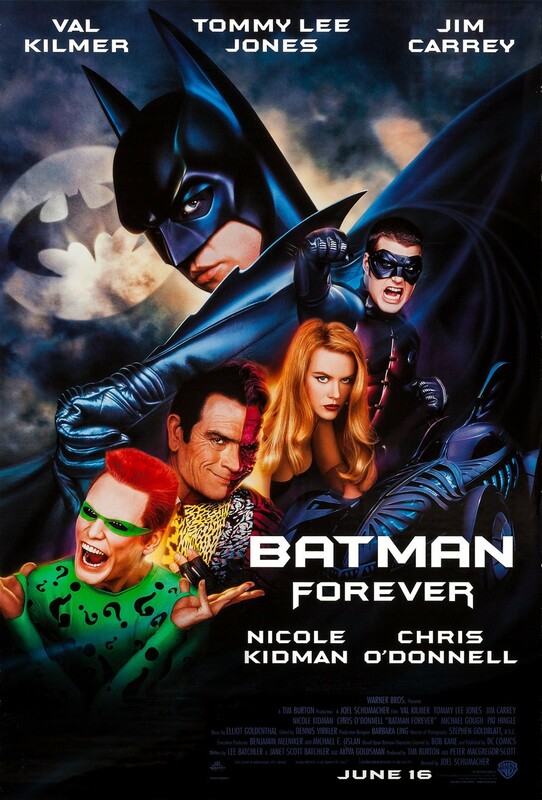 Brace for excitement as Val Kilmer, Tommy Lee Jones, Jim Carrey, Nicole Kidman and Chris O'Donnell star in the third spectacular film in Warner Bros.' Batman series. The Dark Knight is back…now battling two supervillains simultaneously—but this time joined by his protégé, Robin, to protect Gotham City. Jim Carrey stars as criminal genius, The Riddler, and Tommy Lee Jones plays Two-Face. Together, these criminal kingpins present a threat that only the Dynamic Duo—Batman (Val Kilmer) and Robin (Chris O'Donnell) —can stop. And Academy Award winner Nicole Kidman comes to Gotham as the alluring Dr. Chase Meridian, who may steal the heart of Batman Forever. Joel Schumacher (The Client) directs and Tim Burton co-produces this thrill-ride of a movie that thunders along on Batmobile, Batwing, Batboat, Batsub and bold heroics. Hang on!